Candidates achieve certification only by passing the applicable exam defined by the Certification Authority. An individual may self-study or attend an TOGAF 9 Accredited Training Course. Accredited Training Courses either include the exam as part of the course or a provide the attendee with a voucher to enable the candidate to sit the exam at an authorized test center. 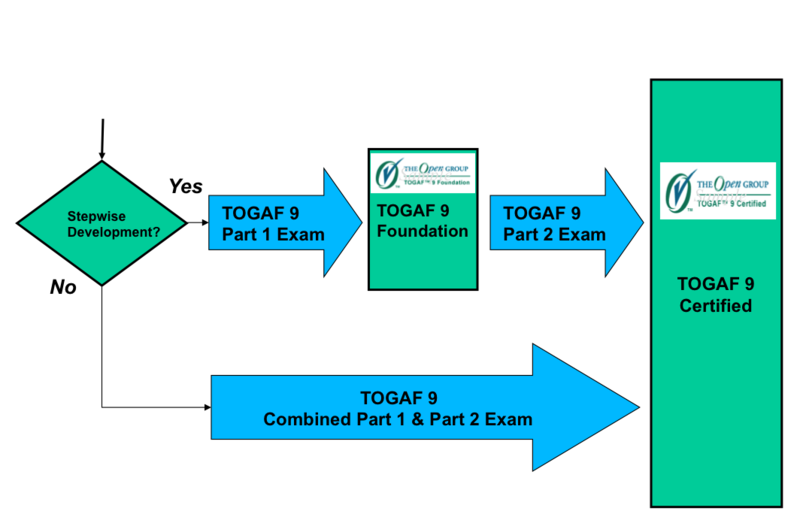 Learn how to become TOGAF Certified. How to complete certification after passing the examination. Once you are certified, you may download a softcopy of your certificate from your entry on the register (if publicly visible) or from your Resource Center, accessible after you log in. You are also entitled to use the TOGAF certification logo applicable to the level of certification you have achieved. Typical uses would be on your business card, email signature, or in presentations. If you want to obtain the logos, log in using the link below to access your resource center where you can accept the logo usage agreement and download the logos. If you have a username but have forgotten your password, you may reset your password. If you don't remember your username or no longer have access to the email address on your account, contact the TOGAF Certification Authority. Also use this link for help with your certification or to report a technical problem with the site, including login and email problems, membership list problems, and broken links).